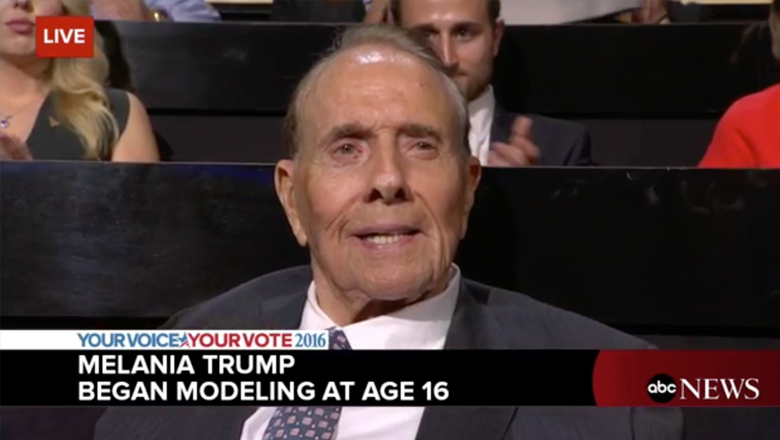 A shot of Sen. Bob Dole being “identified” in a lower third as Melania Trump is making its rounds on the Internet. The image is taken from ABC News‘ coverage of Trump’s speech at the Republican National Convention. During her speech, which has since garnered criticism for its apparent plagiarism, Trump mentioned Dole and the network, quite naturally, cut to a reaction shot. Since the cutaway was so quick, ABC left up the lower third reading “Melania Trump began modeling at age 16” that it had been using for under Trump as part of a way to provide viewers with additional information. This is certainly not the first time something like this has happened — and it’s obvious the network didn’t mean to identify Dole as Trump, but the image is still rather entertaining and the juxtaposition of Dole appearing to being labeled as Trump didn’t go unnoticed online.